As I mentioned in my last post, my great-grandfather Isidore Schoenthal was one of twelve children. He and his siblings were born in Sielen, Germany, the children of Levi Schoenthal and Henrietta Hamberg. The first helpful source I found about his family was a biography written about Isidore’s older brother Henry in 1893 as part of a commemorative book celebrating Washington County in Pennsylvania, where Henry and Isidore both had settled after immigrating to the United States (the “Beers biography”). Given that the Beers biography was written while both Henry and Isidore were still living in Washington, Pennsylvania, I was inclined to give it significant weight as a credible summary of Henry’s life to that point and of the background of his family. I will refer to it in more depth when I focus on Henry himself, but for now I am referring to its assertions regarding the family of Levi and Henrietta (Hamberg) Schoenthal. According to the Beers biography, Levi Schoenthal was born in 1813 and worked as a shoemaker. He and his wife Henrietta had twelve children—nine boys and three girls. Two of their sons died in infancy, but the other ten children survived to adulthood. Of those ten, nine immigrated to the United States, and eight stayed here. (The youngest child, Rosalie, returned to Germany to marry, and one son, Jacob, never left Germany.) Of those who stayed in the United States permanently, my great-grandfather Isidore was the youngest and arrived last, along with his mother and Rosalie, in 1881. Despite believing that this biography was probably fairly accurate, given that it was written so close to the time of the events reported, I nevertheless wanted to find some original German sources to verify the information. Fortunately, I was able to verify quite a bit (but not all of it) by searching through the Hessen Archives as well as US records. I was very lucky to have help from Dorothee Lottmann-Kaeseler (who correctly reminded me after my last post that she had first mentioned Sielen as my Schoenthal ancestral town), Hans-Peter Klein, Matthias Steinke, JewishGen, and the Hessian Archives. Based first on a search through JewishGen, I was able to find birth records for almost all of the children of Levi and Henrietta in the Hessian State Archives. The archived birth records available start in 1846, so I could not find records for the three children born before 1846 (Hannah, 1841; Henry, 1843; Julius, 1845), but using JewishGen and then manually scanning through the records, I was able to find birth records for seven of the other nine, including one for one of the two baby boys who had died in infancy. So far I had not found any birth record for the other baby who died in infancy according to the Beers biography or for Jacob. One of the last birth records I found was the one for my great-grandfather Isidore. I had scanned through the pages several times looking for his birth record, the one that mattered the most to me, of course. But I hadn’t seen it, and I started wondering whether he’d been born outside of Sielen. But then, giving it one last chance, I looked at every baby born in 1858, the birth year I had for Isidore, and saw one with the birth date November 22, 1858. That date seemed familiar (though first I thought only because that was the day of the year JFK was assassinated in 1963), and when I saw that in fact other records had Isidore’s birth as November 22, 1858, I looked more closely at the record. The entry was written in more traditional German script than many of the others, but I thought I could make out a word that just might be Levi. So I posted a snapshot of the record to the German Genealogy group on Facebook, and sure enough my always helpful friend Matthias Steinke jumped right in and translated it for me. Matthias said that for the baby, it says, “Male Gender, Isaac,” and for the parents, “Lewie (??) Schonthal shoemaker and Aesther (??) 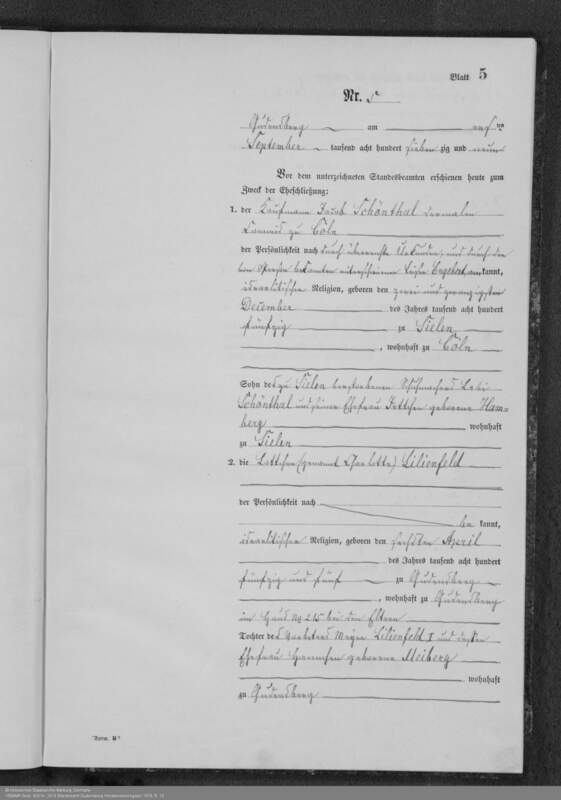 born Hamberg, legitimate parents.” It was clear to me that this was the birth record for my great-grandfather. His Hebrew name must have been Isaac—his secular name Isidore. My guess is that Henrietta’s Hebrew name was Esther or that it actually says Jhette, which was Henrietta’s name in Germany; and I assume that “Lewie” is actually Levi. I was very excited that I now had my great-grandfather’s birth record as well as those of most of his siblings. 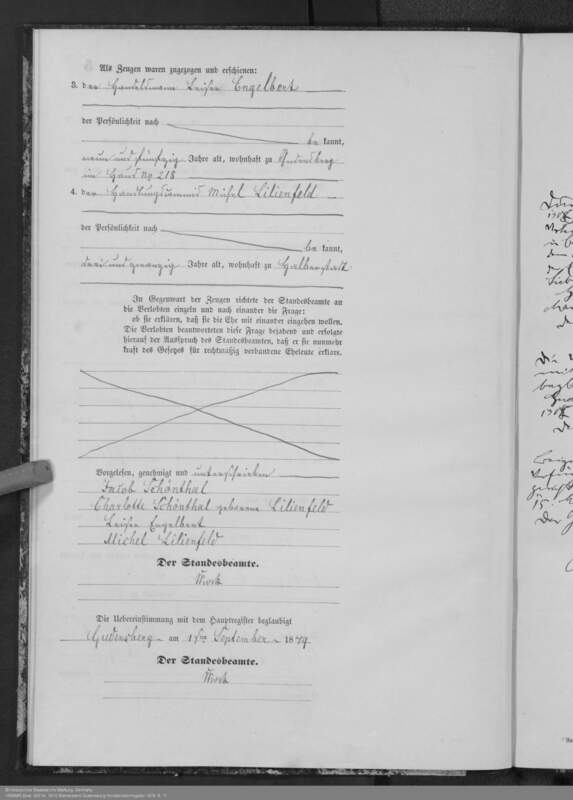 5 – Gudensberg the 1st September 1879 – To the below signing registrar came for a marriage 1. the merchant Jacob Schönthal, at the moment shop-assistant in Cologne, identified by the shown certificates and in person by the present Beisen(?) Engelbert, israelic religion, born the 22 December 1850 in Sielen, residing in Cologne, son of the in Sielen deceased shoemaker Levi Schönthal and his wife Jettchen nee Hamberg, residing in Sielen and 2. the Lottchen (called Charlotte) Lilienfeld, known personally, israelic religion, born the 6th April 1855 in Gudensberg in house nr. 215 at her parents. Daughter of the cantor Meyer Lilienfeld I and his wife Hannchen nee Meiberg, residing in Gudensberg. As witnesses were present: 3. the merchant Beisen (?) Engelbert, personally know, 59 years old, residing in Gudensberg in house nr. 218, 4. the shop-assistant Michel Lilienfeld, known personally, 23 years old, residing in Halberstadt. Followed by the sentence whether they intend to marry each other and the signatures. Now I had another family and three more surnames—Beerenstein, Hamberg, and Rosenberg— to add to my family tree, names I’d never known were those of my ancestors until now. I now had the names of two more sets of my great-great-great-grandparents. I now know the names and something about almost half of my great-great-great-grandparents. I didn’t know any of their names at all when I first started doing genealogy. In fact, I only knew the names of two of my great-great-grandparents. So thank you from the bottom of my heart to Matthias Steinke, Dorothee Lottmann-Kaeselar, and Hans-Peter Klein for helping me find another generation and another branch of my family. This entry was posted in Breuna, Germany, Hambergs, Schoenthal, Sielen and tagged Germany by Amy. Bookmark the permalink. 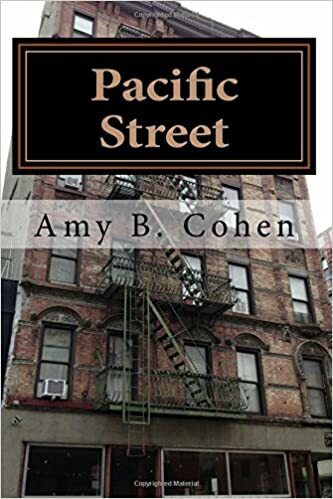 Amy, great that so many people could participate in this search! Any idea what Henry’s German or Hebrew name was? Handel nee Beerenstein -> where does the Brandenstein come from? Thank YOU! Henry’s German name was Heinemann, like his grandfather. As for Beerenstein—that’s consistent with what others found (David Baron and Roger Cibella had Bernstein), but Hans-Peter Klein had Brandenstein in his Genealogie Schoenthal. Since I can’t read the German, I included both here, but I take it you agree with Matthias that the German says Berenstein? THanks!